Voices Against Brain Cancer (VABC) volunteers are a passionate group, many of whom are brain cancer survivors themselves. If you want to help the brain cancer community, please join us in supporting our mission. Anybody can be a volunteer. Start now! Donate your time. Share the buzz! Help us spread the word. Visit our resource center and share the information! Share our posts via facebook and Twitter. How would you like to help? What are your interests? VABC is dedicated to finding a cure for brain cancer by advancing scientific research, increasing awareness within the medical community and supporting patients and families afflicted with this devastating disease. Our foundation funds innovative grants and provides support for the brain cancer community, but we cannot do it without your help. You, the volunteers and donors, are the backbone of our foundation. You have the power to change the lives of brain cancer patients, their families, and caregivers by getting involved. We would be happy to have you as a member of our growing team! Is there something you are really good at? Let us know and maybe we can use your skill to help support the organization and our efforts. 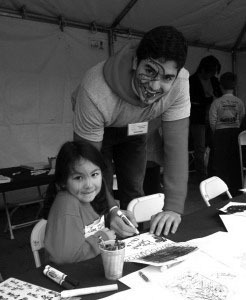 Pictured: Volunteer Jimmy Martone helped kids create holiday cards at the 2013 Join The Voices Run/Walk in Central Park.